Beetroot Masal Vadai is a crispy tasty evening teatime snack with a twist to normal Masal vadai by adding beetroot init. Which makes the vadai more nutritious and colourful. Beetroot is a healthy colourful vegetable the health benefits of beet includes reduces blood pressure by increasing the blood flow and helps to maintain heart health. As it is rich in fibre beets helps to prevent constipation. Choline is a very important and versatile nutrient in beetroot that helps with sleep, muscle movement, learning and memory. Choline also helps to maintain the structure of cellular membranes, aids in the transmission of nerve impulses, assists in the absorption of fat and reduces chronic inflammation. Beetroot juice supplementation has been shown to improve muscle oxygenation during exercise, suggesting that increased dietary nitrate intake has the potential to enhance exercise tolerance during long-term endurance exercise. Source: medicalnewstoday. Soak chana dal in water for 2 hours. Meanwhile grate the beetroot and chop onion, green chillies, ginger and curry leaves. Coarsely grind and transfer it on a bowl. Now fennel seeds, jeera, onion, green chillies, ginger, curry leaves, asafetida and salt. Add the grated beetroot and mix well. If you feel the mixture has more moisture slightly squeeze out the beetroot juice with hand and add(i have not done that). Mix well and check for salt. 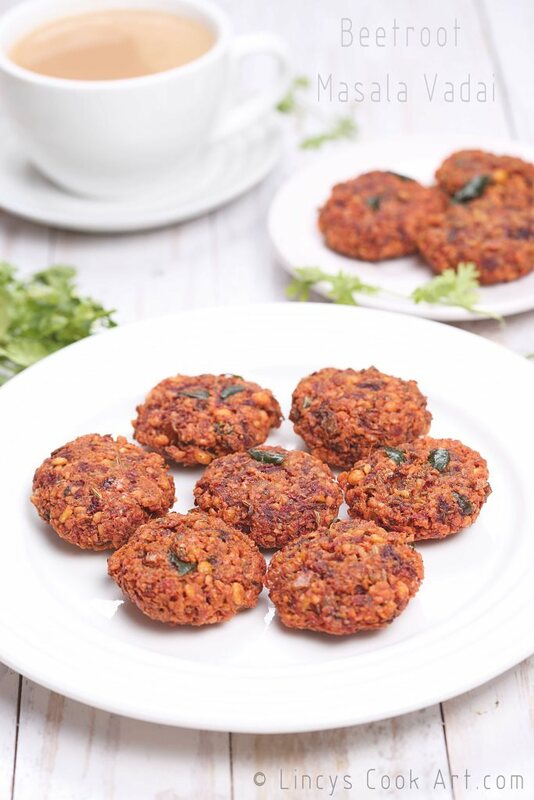 You could add a teaspoon of corn flour to make more crispy vadas. Heat oil in a deep pan and deep fry the vadas till crispy. Note:You could use half a cup chana dal and half a cup of toor dal if you prefer. You could replace green chillies with dry red chillies and soak them with chana dal and grind them together. You could add the fennel seeds and jeera together with chana dal while grinding too. Liked the addition of beets to masal vadai.. Looks delicious! !